I settled on a square layout for the Samsara quilt project. [Thanks to all of you who weighed in on the square vs. rectangular format.] 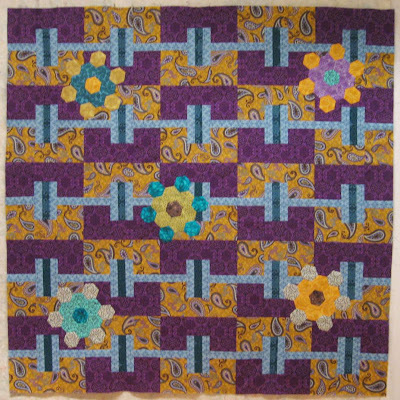 It became a square flower bed and background for the English paper pieced hexagon flowers. Samsara quilt with hexagon flowers (in progress). After doing the threadwork on "Orange Cat," I'm considering it for this quilt. Gotta let the idea simmer a bit before it germinates.